The title of the book comes from a poem by William Sharp, with the lines “But my heart is a lonely hunter that hunts / On a lonely hill.” What is the significance of the title? Is each character in the novel hunting the same thing, or is each in search of something different? 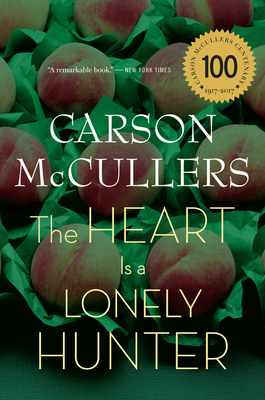 McCullers’s original title for the book was The Mute. Why do you suppose the change was made? McCullers describes John Singer as “an emotional catalyst for all the other characters.” What does his presence inspire in others? Do you believe that he remains inert, as a catalyst by definition should, or is he himself affected by his interactions with the others? Why or why not? McCullers once described the central characters in the novel as “heroic, though ordinary.” How does each character show elements of heroism? Is there a character you find more heroic than the rest? In the book’s first section, Biff’s wife, Alice, quotes Mark 1:16–18: “Come ye after me, and I will make you to become fishers of men.” How does this quote resonate throughout the novel? What role does spirituality play in the novel? Do the characters strive for communion with a higher spiritual force or unifying principle, something greater than themselves? Music has great importance in the book, from Mick’s aspirations to become a pianist to Willie’s ever-present harmonica. McCullers, who had once hoped to study music at Juilliard, even described the structure of the novel as a three-part fugue, and explained, “Like a voice in a fugue, each one of the main characters is an entity in himself — but his personality takes on a new richness when contrasted and woven in with the other characters in the book.” In what other ways does this musicality assert itself in The Heart Is a Lonely Hunter? What does music symbolize in the novel? How, too, is silence used? The novel has been widely praised for its ability to illustrate how social, economic, and racial factors serve to isolate people from one another. In what way is each character isolated? What efforts does each make to overcome this alienation? Are the efforts successful or ultimately futile? John Singer dreams he is kneeling before Antonapoulos, who stands at the head of a set of stairs. Behind Singer kneel the four other main characters: Mick, Biff, Jake, and Copeland. How does Singer’s dream reflect the relationships among the main characters? To what extent is Singer’s love of Antonapoulos similar to the attention paid to Singer by Mick, Biff, Jake, and Copeland? Are these characters capable of loving one another? Of receiving love? Are some characters better emotionally equipped than others? Why or why not? Mick Kelly is considered the most autobiographical character McCullers ever created. Mick’s tomboyishness, her musical aspirations, and her dream to escape small-town life parallel the author’s own. When Mick realizes she cannot afford a violin, she tries to build her own. What does the violin symbolize? What does this act tell you about Mick’s character? Do you have sympathy for her when she fails? Do you feel closer to Mick than you do to the other narrators? Mick compartmentalizes her thoughts into what she calls an inner room and an outer room. Why does she do this? Do other characters show this same type of duality? How does it manifest itself? When Jake Blount finds a Bible passage written on a wall, he responds with his own message and then searches for the person who wrote the original message. Why is it important to him to find that person? Dr. Copeland has great dreams for his family and for his community, but he is unable to gain much support for his ideas. Do you think Copeland’s self-perception that he is a failure is valid? How many of his frustrations are a result of racial bias in society? Why do you suppose his relationships with his children are fraught? The Heart Is a Lonely Hunter has been praised for its sensitive and realistic portrayal of racial tensions in the Depression-era South. What relevance does the novel have today? How much has changed since the 1930s?